Talking about literature, African history and African culture. The title story talks about a young lady, Akunna who is fortunate enough to with the Visa Lottery to live with her uncle in America. She moves out after he abuses her and starts a life of her own in a small town. 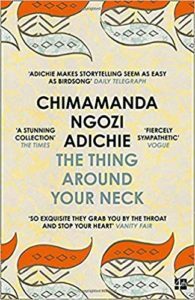 In this episode, we discuss The Thing Around Your Neck by Chimamanda Ngozi Adichie.